If you really want to enjoy some water recreation with a friend or a loved one, a tandem kayak could be an option you’d want to pursue. They aren’t for everyone, but a tandem kayak can help a couple quietly explore the shore or even an estuary or protected nature reserve without the same impact two singles might cause. Let’s find the right boat for you today. Some tandem kayaks just don’t make the grade. Instead of spending cash on a problematic boat, spend your money on one of the best tandem kayaks that you’ll find in the chart below. What Are the Basics of the Best Tandem Kayak? How you choose the right kayak depends on what you plan to do with your new kayak. Trust the Salty Dog on this – some tandem kayaks work better in specific situations than others. Here are some questions to ask yourself. Where will you take your tandem kayak? The #1 consideration needs to be the water your kayak will face. Calm water, like you’ll find on an inland lake, is much different than open water with stiff breezes and chop. How far do you intend to paddle? The length of your journey will dictate how much storage your tandem kayak will need. An afternoon outing of a couple miles has very different storage needs than a week-long camping trip. How good are you at kayaking? If you’ve never sat in a kayak before, then you’ll need equipment that is more forgiving to mistakes and won’t dump you in the drink if you shift your weight just a little. What transport options do you have? If you don’t have a trailer or a truck, then an inflatable kayak might be a better option. If you do have transportation and need a durable kayak, then a hard-shell hull is probably a better option. Kayaks are designed to be fast, hold a person or two, and are highly maneuverable. They aren’t, however, very family friendly. If you want something for the kids to enjoy, one of the best canoes is likely a better option. What Are the Challenges of a Tandem Kayak? Even the best tandem kayaks are longer than the single pilot boats that are available today. This means that they are easier to paddle once you can get them up to a comfortable speed and they’ll hold a straight line pretty well, but they can be a bit heavier and don’t have as much manoeuvrability. Open water is usually a better option for the tandem kayak. If you don’t have open water and you don’t have the space for two singles, then look for smaller and wider tandem kayaks to solve your problems as best as possible. Wider kayaks also tend to provide more stability and are easier to get into and out of during a day of water recreation, but they also tend to be slower. What Are the Prices of the Best Tandem Kayaks? 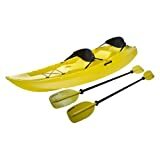 Tandem kayaks are competitively priced on Amazon today. Many good options can be found for under $500. Top of the line options may approach the $2,000 mark, but those are designed more for the serious kayak enthusiasts who hit the water almost every day. Although the limitation of 400 pounds could be problematic for some tandems, the 5 piece touring paddle that fits in with the travel bag makes this one of the easiest tandem kayaks to take almost anywhere. It has a three chamber design and is inflatable, works on salt and fresh water, and may even be suitable for certain river rapids. It isn’t a self-bailing tandem kayak, but it is surprisingly sturdy and that’s why it is one of the best kayaks available right now. At 12 feet, this inflatable tandem kayak is almost more like a canoe. The entire interior is designed to be sit in and there is leg space underneath the bungee cording at the bow of the boat. It’s perfect for lakes and users who like white-water might find it a decent boat for that as well. It makes the list of the best tandem kayaks because of its heavy gauge PVC construction that gives it a reasonably rigid hull. It weighs just 36 pounds when inflated and holds 500 pounds of weight. This 10 footer is designed to be used as a single or a tandem kayak. It’s a sit-on-top design, but a backrest is incorporated into the seating. In theory, this tandem kayak could seat three people, but it wouldn’t be a very comfortable experience. The front cargo area is really nice to have and the tunnel hull design gives this kayak a remarkable level of stability that other designs just can’t provide. You’ll even get sport paddles with a purchase of this boat. Many inflatable tandem kayaks focus on being lightweight or being rigid and durable. This model by Sea Eagle provides both. It has a self-bailing drain valve and offers three one-way valves as well so air management is a simple task. This is the best tandem kayak because it also includes lashed down inflatable spray skirts that will help users take this boat into almost any environment. Even using the foot pump, it will inflate in about 8 minutes. If you’ve got a lake close, then you’ve got the perfect place to launch this tandem kayak. It will hold up to mild white-water as well. Having the skegs underneath the kayak is nice because it takes away a little of the bulkiness that comes with a tandem kayak. A cargo net is included at the bow of the boat and the primary material is PVC for flexible durability. The best tandem kayaks help people go fishing, enjoy a quiet day on the lake, or a multi-day adventure along a favorite river. Take a look at these great products, ask yourself the important questions, and you’ll be able to select the best kayak to meet your needs today.